I am working on my IAPS19 demo presentation this week and I had a couple of AHA moments. I love when that happens! Let me share one with you today. Not every landscape has or needs wildflowers but when they occur it is always good to exploit them and use them wisely. Wildflowers can be a wonderful spice to an otherwise ordinary landscape. Here is why......spice in a painting is an area of contrast. Contrast acts like an eye magnet. We are drawn to look at areas of contrast. Deliberately placing areas of contrast (spice) can help create the movement of the viewer's eye around a painting. This means that we have control over the wildflowers in the painting. We don't want to scatter them randomly or even copy the way they appear in our reference. Instead we need to take charge and plan where they will be planted! 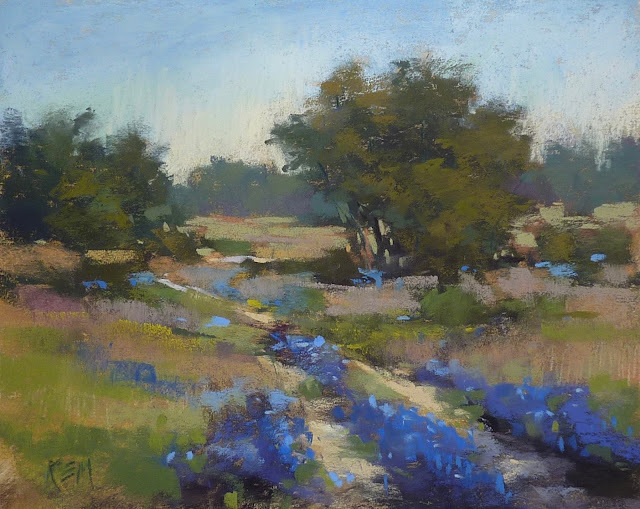 In the bluebonnet painting today notice how I have created areas of contrast within the flower masses. The lighter flowers stand out and draw the eye back into the distance. I have also used other areas of contrast to help create a visual journey. TIP: Areas of contrast are simply opposites. Here are a few: warm/cool intense/dull soft edge /hard edge thick/thin. detail/out of focus light/dark. Plan your areas of contrast. Don't leave them to chance. Don't overdo them. Like a spice a little contrast goes a long way. Flowers everywhere don't have as much impact as a few well placed flowers! Whether up close and personal or a small part of a landscape, wildflowers add the perfect spice. 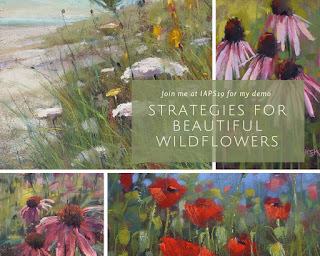 Learn how to invite your viewer into your paintings with beautiful flowers. Karen will demonstrate and share strategies for painting expressive flowers and grasses that look natural and believable. Click here for more information on the convention. You don't want to miss it! 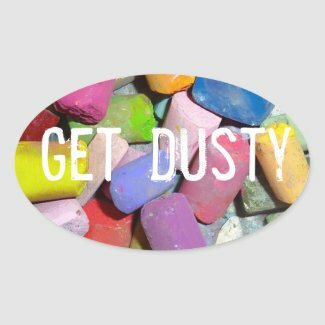 So beautiful, creative and lovely projects !! !